It’s always nice to be on the ballot. Please take some time and nominate The Flying Fish Sailors for the Best Folk Music category! This is going to be a GREAT event. Many of the people involved are also involved in the Houston International Festival and the Bayou City Art Festival. I don’t have the full entertainment schedule yet, but The Flying Fish Sailors will be headlining on the main stage on Sunday afternoon at 5:30 pm. 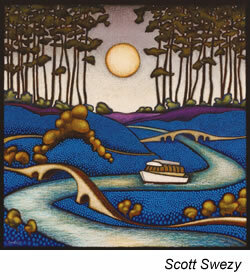 A new fine art festival has been added to the spring Texas fine art festival tour! Produced by The Art Colony Association, celebrating 35 years of independent artist support through fine art festivals, and presenters of the nationally ranked Bayou City Art Festivals, Houston. The Woodlands Waterway Arts Festival is a juried fine art festival featuring 200 national, and regional artists selling their original creations along a 1.25mile waterway park. The wonderfully landscaped site with water taxi service along the whole festival makes this a unique event that artists and patrons will enjoy.